”, Stones Throw Records Mayer Hawthorne (“No Strings” & Green Eyed Love) and remixes for Holy Ghost I Will Come Back (Classixx Acapulco Nights Version), Groove Armada- Black Light Deluxe Edition (Feat. “Paper Romance (Classixx Version)”) and Groove Armada Drop The Lime- Devil’s Eyes Remixes Trouble & Bass. They are fast becoming superstars and they haven’t even released their debut album yet! 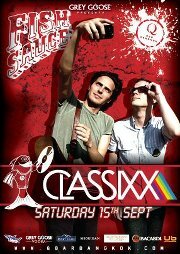 Don’t miss the return performance by LA’s rising stars, CLASSIXX!! !